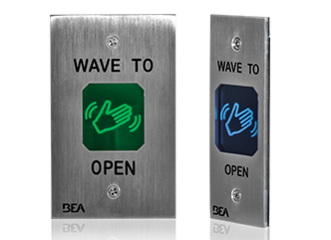 The 5900 Series ICU/CCU Manual Sliding Door Systems are the future in Hospital / Healthcare facilities providing simple, easy, attractive access in and out of patient rooms. 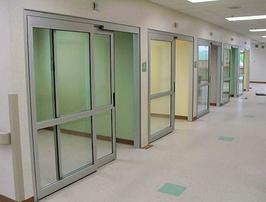 These manual sliding doors are available in trackless two and four panel or three and six panel telescoping configurations and can be equipped with standard or trackless bottom guide operation. 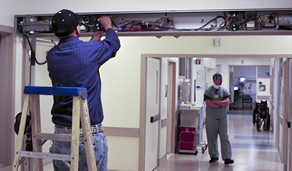 The 5900 Series Trackless ICU/CCU Manual Sliding Door Systems are the future in Hospital / Healthcare facilities providing simple, easy, attractive access in and out of patient rooms. These manual sliding doors are available in trackless two and four panel or three and six panel telescoping configurations and can be equipped with standard or trackless bottom guide operation. Oratso Corp is capable to assist with your ADA requirements. As a business owner or operator, or someone thinking about opening a business, you may have wondered what you have to do to comply with the Americans with Disabilities Act (ADA). This course explains how the ADA applies to businesses in ten short lessons. Putting these lessons into practice will allow you to comply with the ADA and welcome a whole new group of customers to purchase your goods, products, and services. And you may find that making your business more accessible and welcoming to people with disabilities is not as difficult as you thought. "No qualified individual with a disability shall, on the basis of disability, be excluded from participation in or be denied the benefits of the services, programs or activities of a public entity, or be subjected to discrimination by any public entity." The Record CLEANCORD stainless steel sliding door is designed for use in clean rooms to automatically separate clean zones. Its smooth, flush-finished surface prevents dirt from collecting, and the proven record system is reliable, low-noise and user-friendly. clean rooms for the production of foodstuffs, etc. if required, door panels can also be finished in plastic of any colour, according to the décor and your taste.